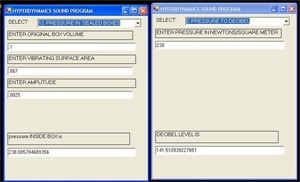 Various sound files and learning items. Meter instruction manual. Computer software program that converts millivolts to db or db to millivolts just by hand typing it in. Works with any ordinary computer, even old slow one's, just pop in the CD and the software works automatically. Photos of hundreds of world class and just insane car stereo systems. Shock waves, nuclear bombs, cars that are "sick", supersonic jets and much more. 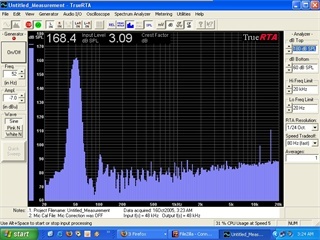 A must have for professionals, car stereo expert's or "bass heads"
This turns your computer and our meter into a Laboratory Grade Spectrum Analyzer, Sound Pressure Level Meter and Real Time Analyzer and Oscilloscope for total sound analysis! 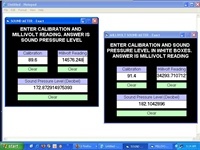 See your frequency and decibel level change instantaneously and constantly in REAL TIME! Just like watching a movie. 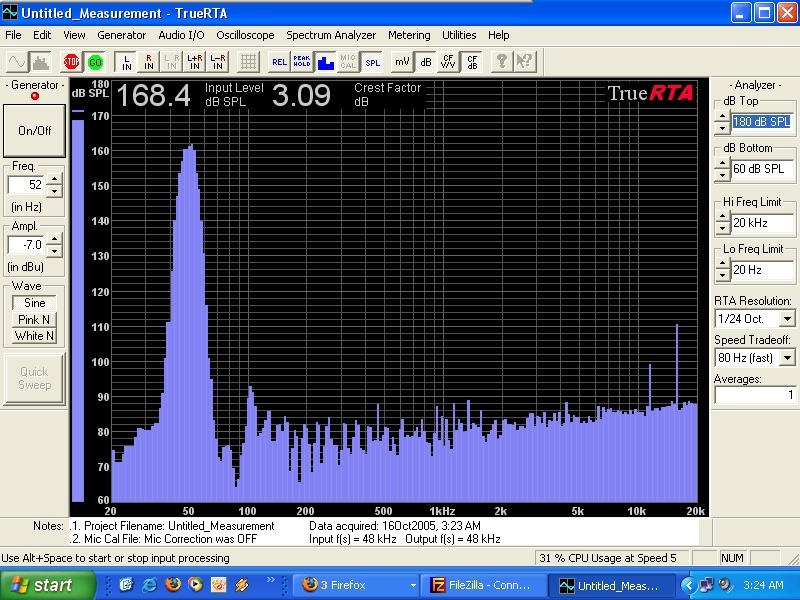 A major added benefit is that the 186db microphone sensor can go into very low decibels with it: about 72db total sound pressure level, and 50db in a 1/24 frequency octave level! 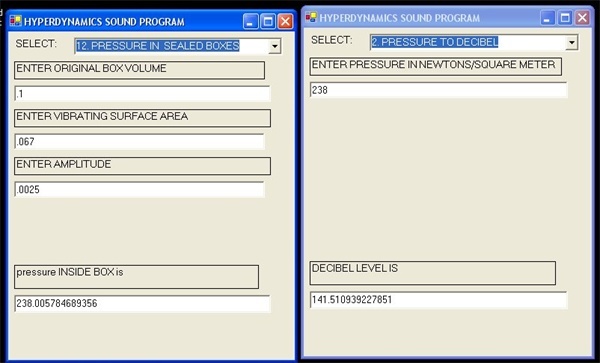 So the total decibel range is extremely wide, just compare to any other company in the world at any price. 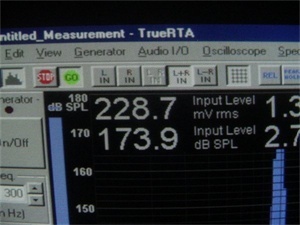 The RTA laboratory microphone also has a wide range of at least 24db-30db to 127db. Calibrate a home theater system or stadium! Uses the normal computer sound card input /output jacks, the mini plug's 1/8 inch size that is standard on all computer's or laptop's. Even without the microphone you can also simply plug in a home theater system or ipod to see music. Comes with cables and installation kit. 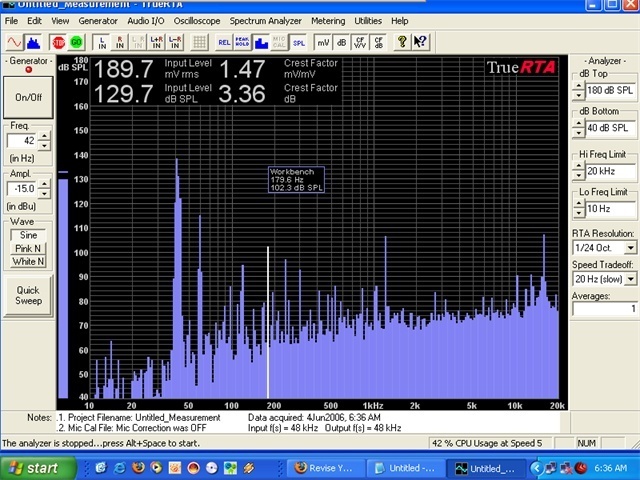 Has an automatic calibration function to perfectly calibrate your computer sound card, so it does not require any special or expensive sound cards, the one in your computer now is perfect. 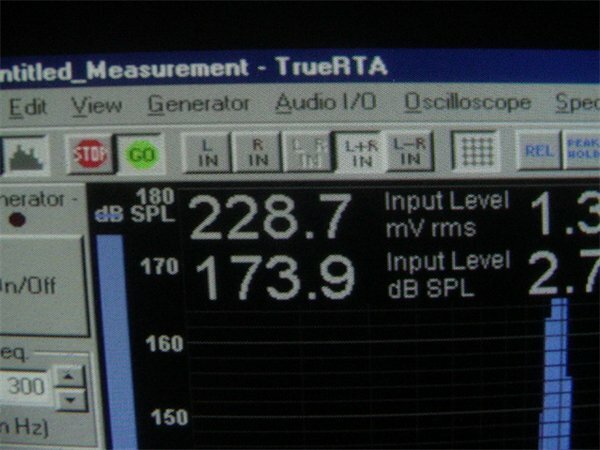 The spectrum analyzer program goes from 0 decibels to 180 db in 10 db selectable choices and 1 db per division line visual resolution and 0.1 db decibel number resolution. Microphone Frequency Range is extremely wide, from: 5(five)hertz to 20,000 hertz. spectrum analyzer sound level meter is from 10 hertz to 50,000hertz and your choice; selectable 1 octave,1/3, 1/6, 1/12 to 1/24 octave resolution!!! 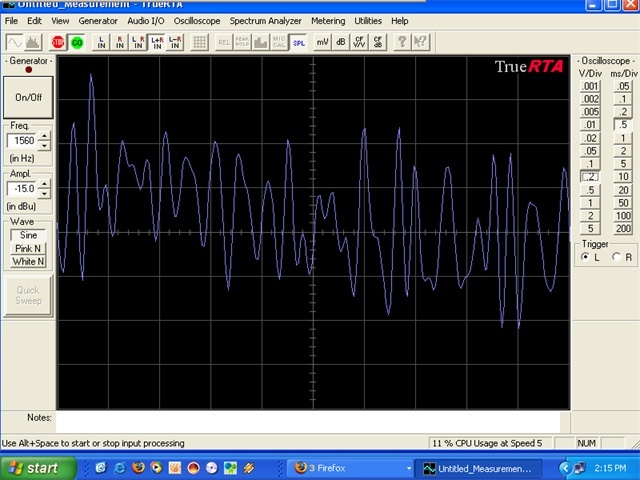 It also has single individual spectral line focus highlighting with frequency and decibel data. It also has time averaging and manual or automatic selectable computer speed resolutions to optimize your computer for best possible performance. Using only your computer it will also play music that is coming from your own computer music files mp3 or C.D. 'S so you can "see" your favorite song in action! Requires a calibration and learning process which takes a normal user about 1 hour. It is not an instant plug n play system. Runs on all standard Microsoft Windows formats; 98, 98SE, 2000, ME, 2002, XP, VISTA, PRO, 7, 8, 10, OR a MAC with a WINDOWS emulator. It can even run on older slower computers with ease. 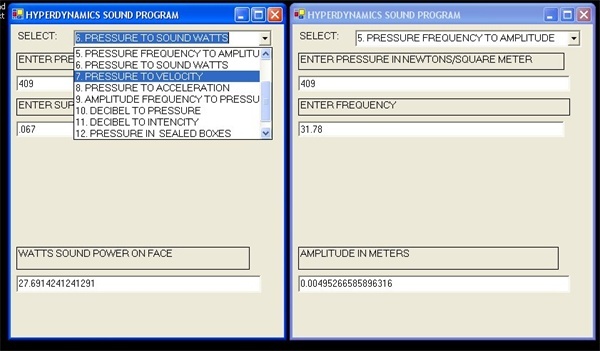 This program that lets you calculate everything involving sound and vibration! Your 100% total sound solution. With this you can analyze: decibel level, amplitude, total wattage, intensity, pressure to amplitude, amplitude to intensity, displacement, velocity and acceleration levels, vented and sealed box resonance and much more. 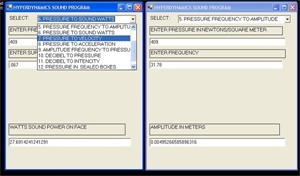 With this program you can calculate actual measurements using our microphones to figure out real life problems involving vibration and displacement and accelerations of real world objects from buildings to jet airplanes, drastically reducing the need of very expensive accelerometers and related high power computer processing. 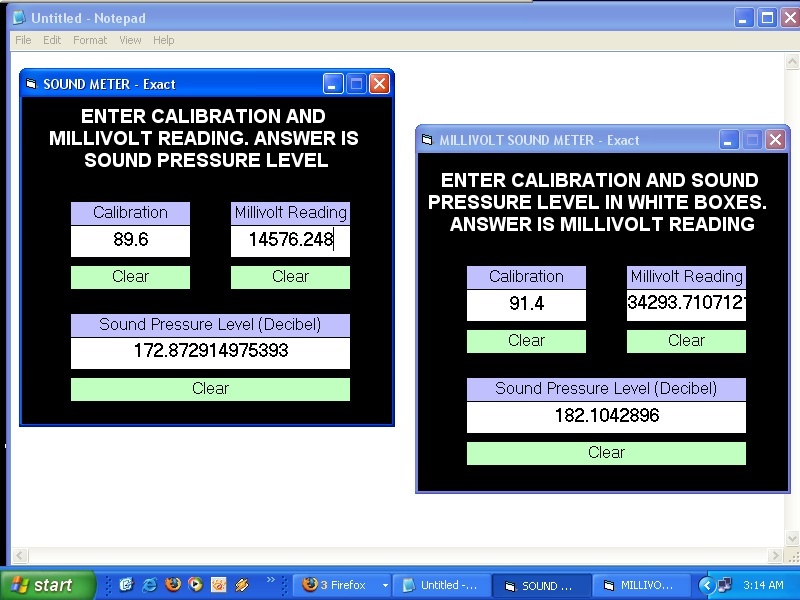 Very simple to use, just type in your microphone and or theoretical test data measurements. Even though it was originally created for the U.S. Military and N.A.S.A. type laboratories it works great for the factory, ordinary project, engineer or soundman. Makes high power projects and sound systems easy, predictable, and economical, saving you lots of money and time. Price is $349 for software only, our meter sensor is NOT included. Or with purchase of microphone sensor for $259 get this computer program for $249 a $100 discount!